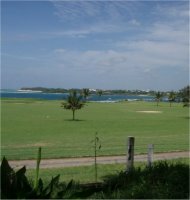 The Mombasa Golf Club sports a 9-hole course, and provides some amazing views while you play. The course overlooks the Indian Ocean and stretches of white beaches. Though it may be beautiful, it has a reputation among golfers as a tricky course. The club is located on Mama Ngina Drive, just east of Kilindini Harbor in a very affluent residential neighbourhood. It's one of the oldest golf courses in Kenya, founded back in 1911. The golf club hosts the Coast Open competition each year, also known as the Barry Cup (named after one of the club's founders, Percy Barry). The Coast Open is mainly a Kenyan event, though in 2008 there were also golfers from Dar es Salaam, adding an international element to the Open. The club also hosted the 2007 IAAF World Cross Country Championships. Though not a golfing event, it does show that the grounds are worthy of a world-class athletic competition. As a tourist, you can purchase a day membership for 1,500 KSH. Rental for a set of clubs is 800 KSH, and you can hire a caddy for your 9-hole round for 100 KSH. Check ahead to verify the fees, and to reserve a tee time. There are a few other courses you might want to check out while visiting Mombasa. Nyali Golf and Country Club is an 18-hole course on the north coast of the island, and the Leisure Golf Club is on the south side, also with 18 holes. The Malindi Golf Club is another 9-hole option. If you're planning a trip to the Mombasa area, you can easily combine your love of golf and exploration of Kenyan wildlife. Many tour companies now offer "golf safaris", which conveniently packages up the typical game preserve safaris with a chance to play at many local golf clubs. It shouldn't be too hard to find a package that includes the Mombasa Golf Club. Flights to Mombasa – What Are Your Options? Mombasa Safari - What Are Your Options?